This past weekend I attended a digital-to-platinum printing workshop sponsored by the Center for Alternative Photography at the Penumbra Foundation in New York, and taught by the inveterate fine art platinum photographer, Carl Weese, CAP has studios and darkrooms dedicated to alternative processes, such as tintype, platinum printing, Daguerreotype, Calotype, and more. What I found most attractive about this platinum printing class is that teaches how to create a platinum print from a digital image. Platinum/palladium printing is almost as old as photography itself, but it did not become really practical until the late 1800's. Its extensive tonal range, and the fact that the platinum/palladium mixture embeds itself in the paper it does not mask the surface texture of the paper. This results in a tactile experience akin to water color painting. 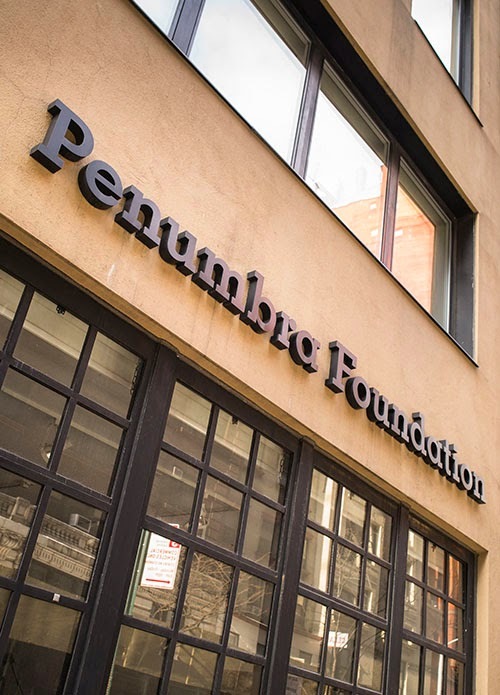 The Penumbra Foundation is located at 36 East 30th Street in Manhattan. 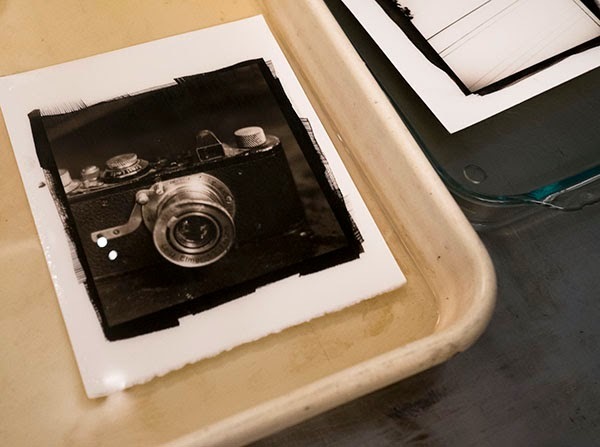 Platinum is a contact printing process using a strong UV light source. Originally, in its early days, this meant exposing the print to sunlight. Today we use high intensity UV fluorescent lamps. 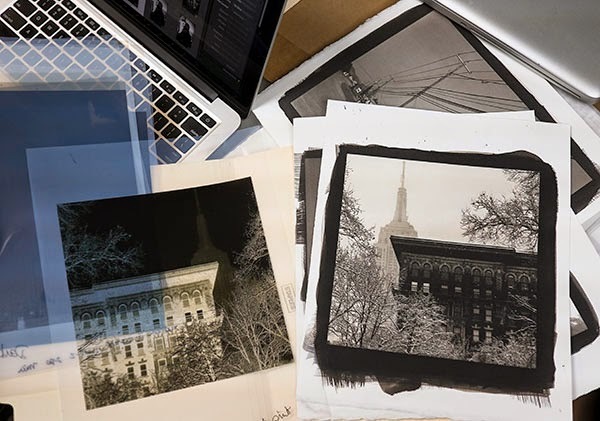 The size of the negative will determine the size of the image -- not a problem when using large format, but for small negatives or digital, the image needs to be enlarged and reversed onto a transparency medium. 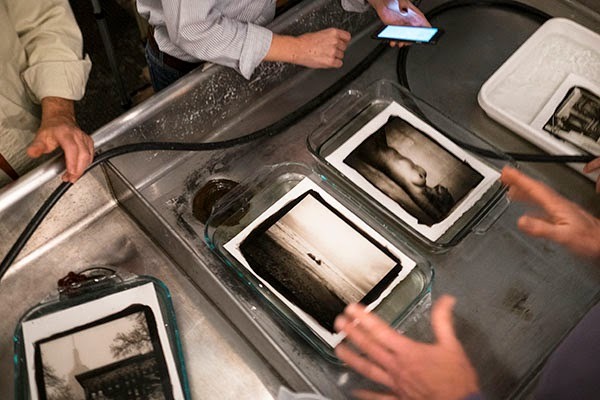 Platinum printing is a mechanical process not too difficult to master, but prepping a negative is another story. 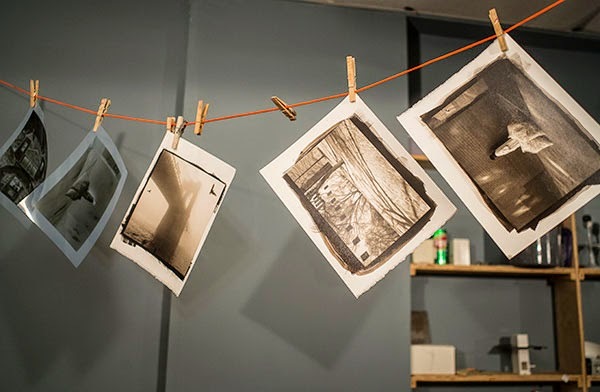 In some respects made more difficult because it is a bit counter-intuitive for those of use already familiar with silver-based black & white darkroom printing. 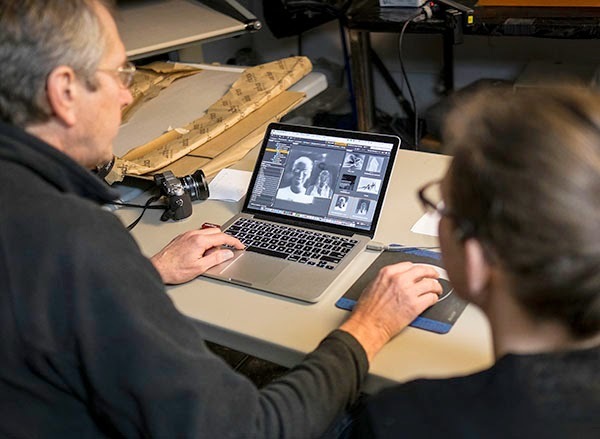 Carl working with one of the class members to prepare a digital negative of a scanned image. The negative for contact printing prints out nicely on an Epson 3880 printer using either Pictorico or Fixxons transparency medium. Class participants going over the process of creating a negative. Platinum or Palladium or a combination of the two are mixed with ferric oxilate to make them more reactive to light. Even so the mixture is only responsive to long exposures to a strong UV light source. We ended up with a 7 minute exposure time. This shows the chemistry that is mixed just before use: equal amount of ferric oxalate palladium or a platinum/palladium mix that together is the same amount as the ferric oxalate. 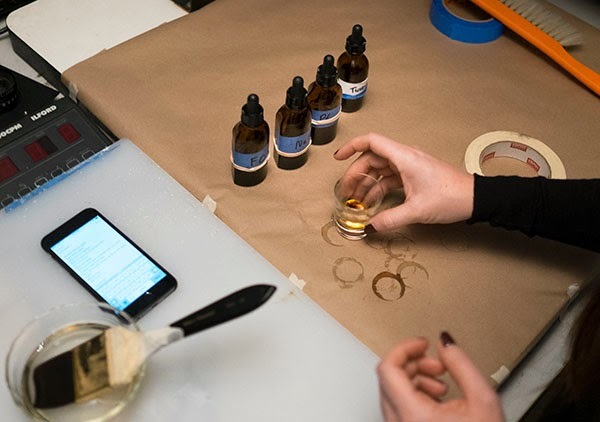 For a small print, for instance, we were using around 10-12 drops of each. 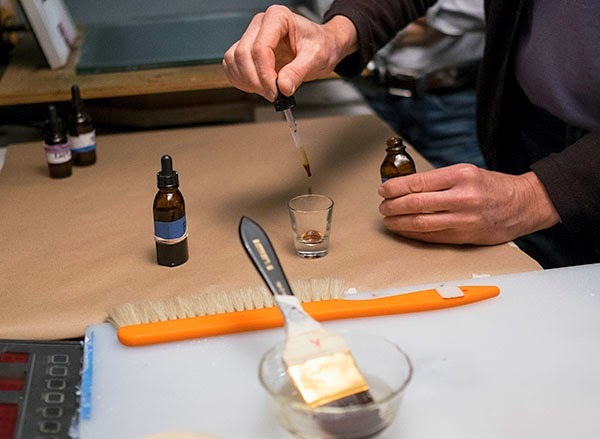 A couple of drops of Tween 20 are added to facilitate the spread of the mixture over the paper. The platinum/palladium is applied to the surface with either a brush or glass rod. 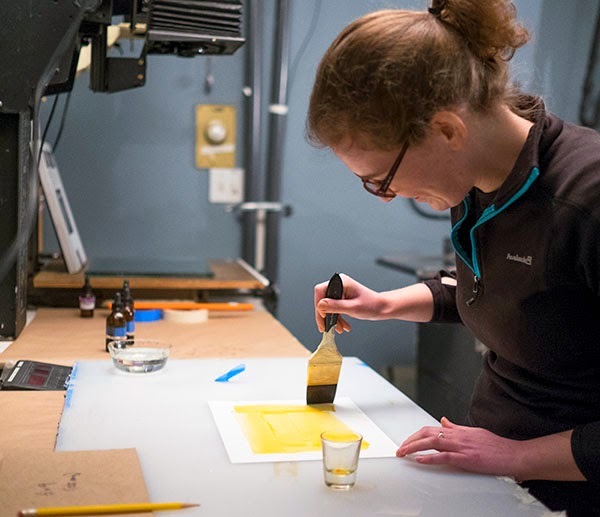 Once the paper is sufficiently dried it is sandwiched with the negative and exposed in a UV box -- in our case, for 7 minutes. Now for the fun part. 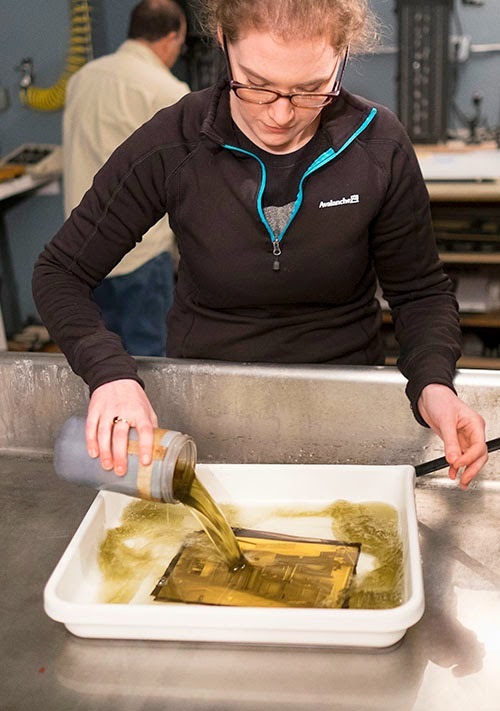 The exposed print is dropped into a tray and the developed immediately poured over it. Talk about instant gratification: The image appears immediately, although it takes a 90 seconds to fully mature. Here the prints are being treated to a series of water and fixing baths after being developed. Hang them to dry and you're done. Nice thing is that platinum prints are much more impervious to curling than silver prints,, and are ready to go as soon as they are air dried. Negatives are made on a computer using Photoshop or other suitable post-processing software. The file is printed on transparency material on a printer like the Epson 3880, and finally the print is made by direct contact with the negative. 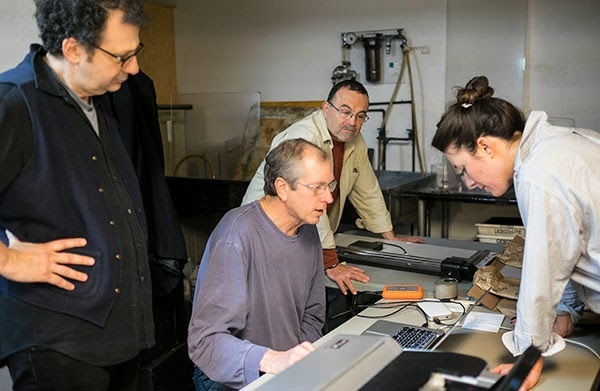 Carl Weese gives his digital to platinum workshop several times a year at the Center for Alternative Processes. 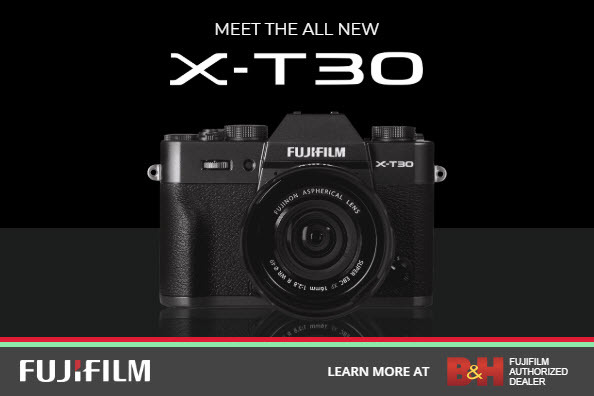 It's well worth the effort for anyone who, like me, has a desire for the tactile experience of photography -- a great way to spend the weekend. One of the platinum prints I made this weekend of a digital photo taken with the Fuji X-T1 of a Leica 1 from 1931. How does the Platinum print look detail wise compared to a regular good pigment print? I have seen traditional Platinum prints from lare format gelatin negatives and they are magical, but I'd have thought the inkjet created negative wold loose a lot of detail and tonality in comparison... but I've never seen one. The whole trick to this process it learning how to achieve a high quality inkjet negative. Once you've mastered that, the process is fairly strait forward, and platinum images have a wide tonal range. One thing to keep in mind is the that the paper used for the platinum print may have its own texture that adds or subtracts something to the overall look, depending upon what you are after. 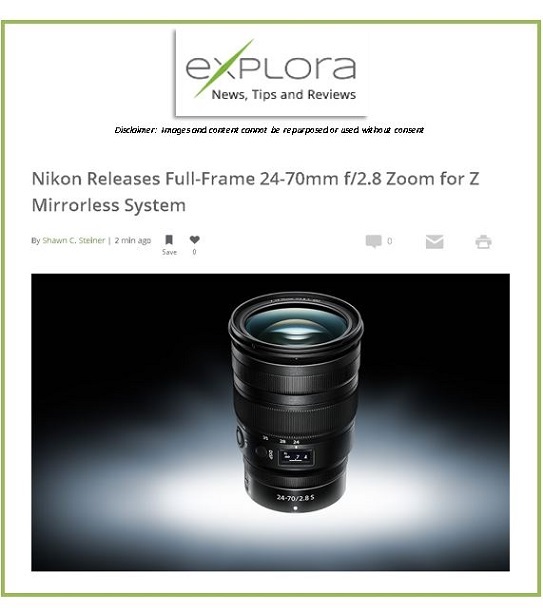 Tom, your blog has quickly become my favourite website regarding photography. It's like a treasure trove full of interesting knowledge about all aspects of the art.